The structure of homogeneous rotating turbulence at moderate Reynolds number is investigated by analyzing the instantaneous statistics of the scale-dependent velocity gradient tensor perceived by a set of four fluid elements equally spaced. The relative orientations between dynamical vectors such as vorticity, rate-of-strain eigenframe, and vortex stretching vector, together with their orientations with the rotating frame, are measured by direct numerical simulation at different rotation rates. Measurements are performed in the entire inertial range of scales. 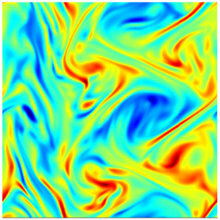 The preferential orientation of turbulence with the rotating frame is found to be maximal at the scale of the horizontal large structures of the flow. The relative orientations between dynamical vectors exhibit a continuous and monotonic evolution with scale. Overall, the orientation properties reflect the Gaussianization and two-dimensionalization of turbulence under the effect of rotation. In particular, rotation suppresses some alignment properties valid in isotropic turbulence, which in turn induces a strong decrease of the enstrophy production and strain production rates. These results are found to be valid at all scales.